On Thursday, December 6th, Volition Franklin Youth FACT group met with Representative Jessie Rodriguez to share the work they have been doing, specifically around youth tobacco and vape use. Students explained how cigarillos and e-juice are flavored and packaged like candy. Almost 9 in 10 cigarette smokers tried smoking before they were 18 years old. Today, almost 75% of high-school aged youth using tobacco products reported using a flavored tobacco product. Volition Franklin Youth FACT group helps spread the truth about tobacco by encouraging healthy, informed decisions amongst their peers. Franklin High School student senate hosted their 2nd annual Halloween Spooktacular. Volition Youth participated by offering cookie decorating to youth in the community and their parents. We had signage that said “candy flavored vapes are a trick not a treat” and gave out coloring books and comic books about children living tobacco and drug free. We also provided education about e-cigarettes to adults. 100 children and their parents participated in the event. Red Ribbon Week is a nation drug prevention awareness campaign. Franklin supported Red Ribbon Week by doing activities in the middle and high school all week. On Monday we were at the high school holding signs with facts about tobacco, vaping, underage drinking, and drugs on them. We also handed out bookmarks with a drug prevention message to English teachers to distribute during class. Students also read announcements each day stating drug facts, defining red ribbon week, and encouraging students to wear the color red on Thursday (last day of school for the week). 300 book marks were distributed. On Wednesday our middle school students passed out “tobacco tricks not treat” candy during lunch. Students also created posters to place around the lunch room walls with facts about the negative health effects, costs, and tricky advertisement of tobacco products. About 700 students were reached during this activity. On Thursday we went back to the high school to display the posters and distribute red Volition socks and red ribbons so students could participate in the wear red day. 200 ribbons and socks were given to students. Students were encouraged to take a selfie wearing their new red gear and post to social media with #VolitionFranklin. Posters were hung on Volition member lockers advertising Red Ribbon Week and reminding them of the contest. Of all the students who posted to their social media accounts, one was selected at random to win a $20 Starbucks gift card. One lesson we learned is that if a student has a private account, we are not able to see their photo, even if they use the hashtag. Moving forward we will encourage students to first like or follow Volition social media prior to posting their own photo. Overall the socks were well received by students. 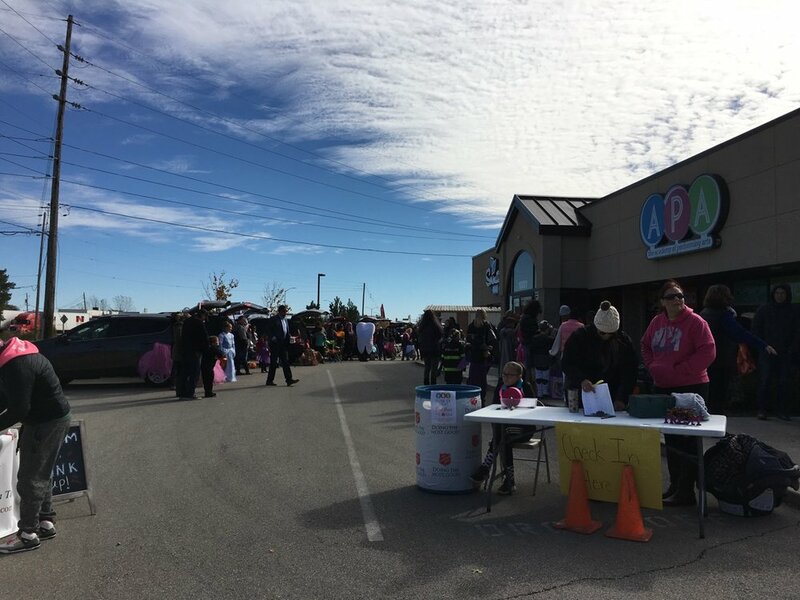 Volition Youth participated in the Academy for Performing Arts, a community partner’s, Trunk or Treat event. 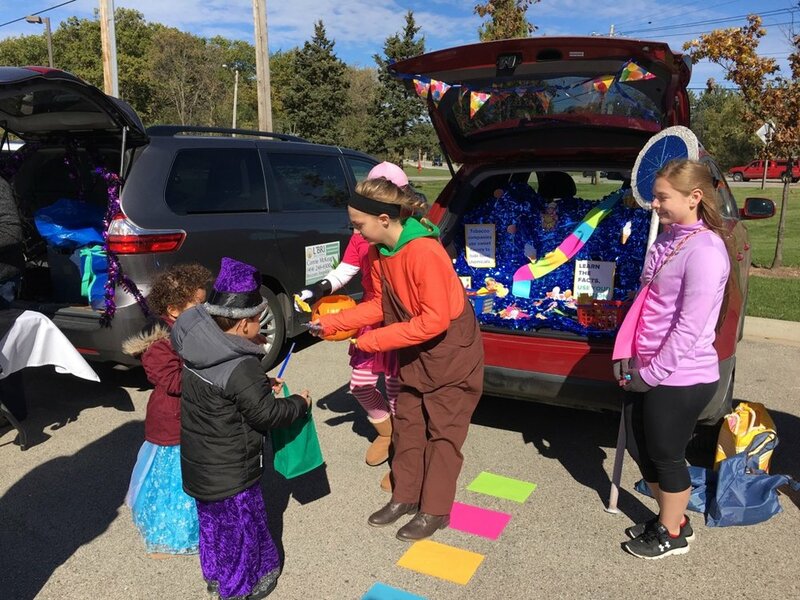 We decorated our car and dressed up like Candy Land characters. We passed out candy and candy-sharped erasers to children participating in the event. The candy had a sticker on them that said “candy flavored tobacco is a trick, not a treat”. We also took time to educate parents about vaping and flavored tobacco. About 50 children and their parents participated in this event. Our meeting was packed with FACTivims! Students participated in a Tobacco Shoe Swap game which helped educate our youth about disparities related to tobacco use. We had a dicussion about social inequalities and privilege and how we can use this information in our tobacco prevention messaging. Students then put stickers on candy or candy-looking erasers that said “tobacco tricks not treats”. We will pass this out during lunch later this month. Some students also helped make posters to put around the cafeteria helping to define what the candy messaging means. On September 24th, Volition hosted speaker, John Underwood, former NCAA All-American, International-level distance runner, World Masters Champion and Olympian coach. John spoke about how lifestyle choices impact our mental and physical performance. Students handed out pens and information sheets about joining Volition at both presentations. At night, they offered a Big Deal Wheel game where participants had to answer a question about school policy, alcohol facts, or Volition for a chance to win a prize.